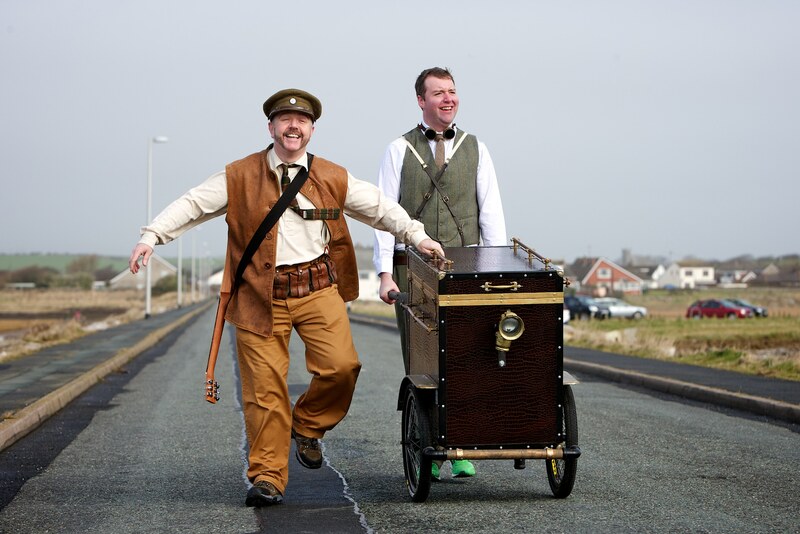 The Vagabonds travelled over 100 miles, mainly on foot, through the countryside of the Lake District and South Cumbria, performing shows along the way for visitors and local residents. The trip is inspired by the travels of Walter Wilkinson, a world famous showman and puppeteer, who toured throughout the British Isles and the United States during 1920s and 1930s. Wilkinson set up his show wherever he could find an audience and wrote travelogues of his experiences which became a series of popular books. The journey began on the historic Piel Island in the south-west corner of Cumbria on Tuesday 3rd May 2011 and over the following three weeks we travelled between visitor attractions and isolated rural communities as far north as Ambleside before making our way back to Barrow. I had long had a fascination with the journeys of Walter Wilkinson and a similar theatrical adventure had been top of my list of ambitions for many years. Like Walter Wilkinson we travelled with a small cart that doubled as a puppet booth and carried a collection of puppets, props and instruments – as well as a tent and a change of clothes. The Vagabonds was a Headzup project delivered in partnership with Lakes Alive. The following blog is my account of the adventure.